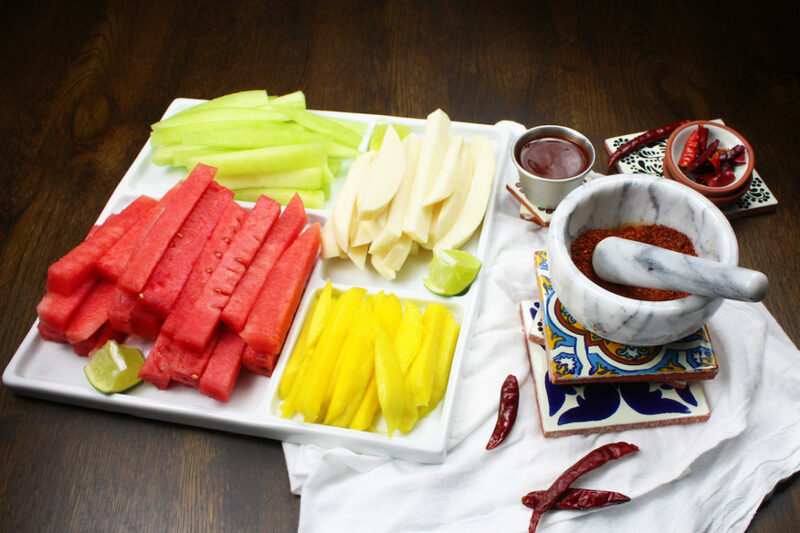 Mexican fruit salad is a staple in Latin America. Whether you’re in a park, at a festival, or just walking around town, you’re sure to see street carts selling these delicious and healthy fruit cups. The dried chiles add smoke and spice, while the lime adds a bright and fresh kick. I’ve seen people make this recipe and use pre-ground spices such as cayenne or paprika. It’s not the same. Starting this recipe with whole dried chiles is what makes it so delicious. This recipe calls for a combination of Arbol, Japones, and Ancho. To learn more about these chiles and others, see our Complete Guide to Dried Chiles. When it comes to the fruits, have fun and use whatever is in season or what you have in your refrigerator. The choice and portions of fruit depends on your preference. 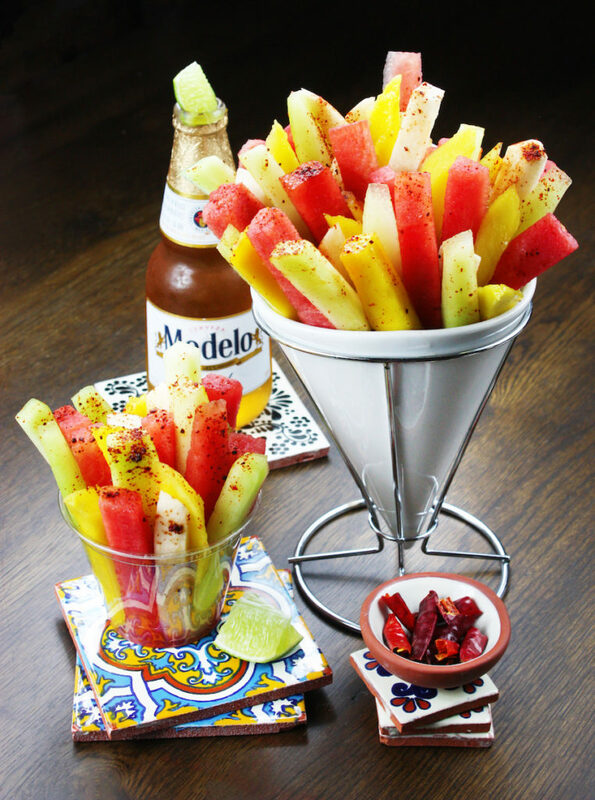 You can get creative with this recipe and add cantaloupe, pineapple, coconut, or cucumber. Heat the dried chiles on a comal, or a skillet, over low heat. Turn the chiles often, making sure they don’t burn or turn black. Once you can smell the chiles, they should be warmed through and ready to use. Allow the chiles to cool down, pinch the chiles to break the skin and shake out all of the seeds. Make sure you wash your hands and avoid touching your face. Whole chiles make all the difference here, dried and ground spices lose their complexity very quickly and don’t offer the same amount of flavor. Tear the chiles in small pieces and place them in a spice grinder or in a mortar and pestle. Add the salt to the chiles and grind them until they form a fine powder with small flecks of chiles. Now the easy part, peel and cut your fruit into thin sticks. I find it easier to fill the cups if the fruit is slightly thinner at the bottom, similar to a wedge shape. Once all of your fruit is cut, arrange several pieces of each fruit in individual cups. 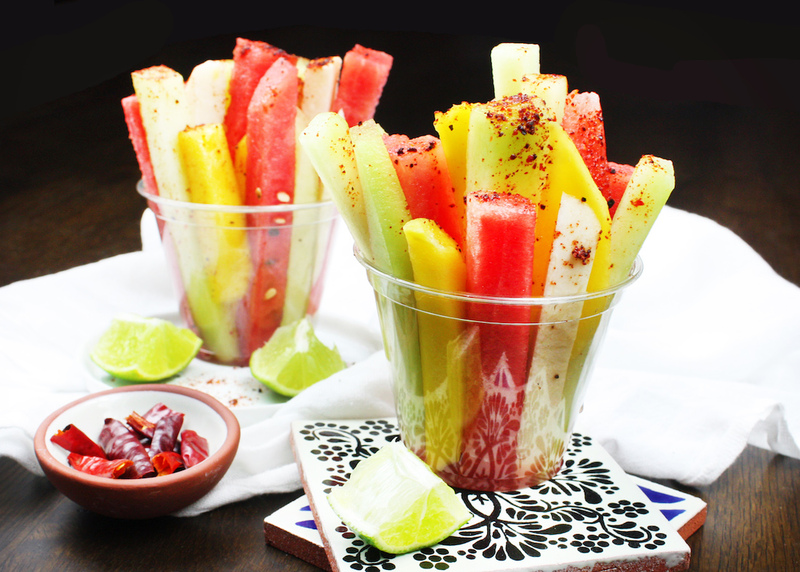 Drizzle each cup with lime juice then sprinkle with the dried chile mix. TIPS: Chiles are notoriously unpredictable, some are hotter than others, some have no heat at all. It depends on their age, where you bought them, and the season they were grown. You can always add more, so start off light. That being said, the sweetness of the fruit really mellows out the spice, so don’t be deterred if you try the spice mix and it’s little too spicy.